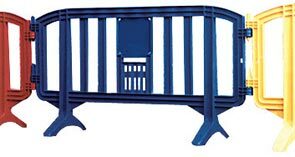 Movit® Safety Barricade, a one-piece interlocking unit with no weak points. Manufactured with durable lightweight polypropylene material. These environmentally safe safety barriers are easier to handle and are less expensive than steel or concrete barriers. This security barriers system is perfect for both indoor and outdoor activities. Tested and proven to be an excellent barricade for a variety of applications. Barricades nest for easy storage and conform to the standards of 4.1.2 of ANSI A10.18 as well as UNE 53-028-90. Available in 6 standard colors options barriers can be customized with logo or wording (minimum custom order: 150 units).